Well then, that was a rather bland train wreck if I ever saw one. I’m not sure if it’s the timing of the series (the final hours before the All-Star Vote deadline), the Adeiny Hechavarria trade, the Mets themselves, or the fact Tim Tebow was promoted to St. Lucie but man this is the first series in a long while that was lacking, win or lose. In honor, or dishonor, of this event I will forgo the usual section detailing the star performances of the series and throw a changeup. But more on that later, onward to the review of a forgettable series. 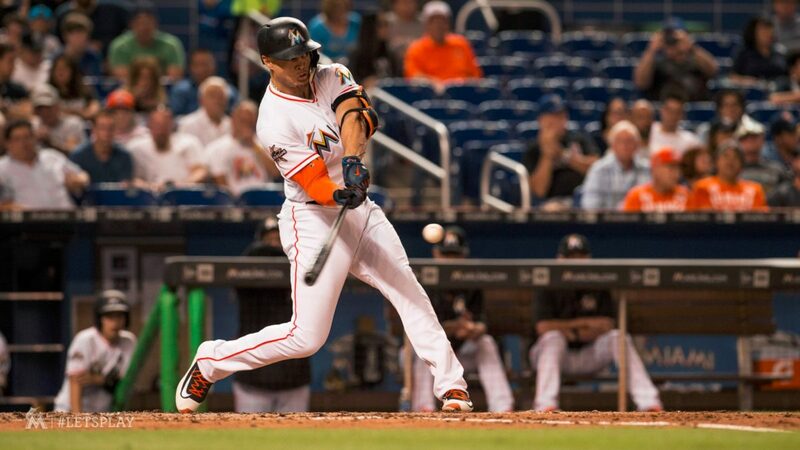 The series opener started good enough as Justin Bour opened things up with a two-run line drive to right scoring Giancarlo Stanton and Christian Yelich. Martin Prado followed up with a double, bringing Bour home, helping the Marlins spring forward to a 3-1 lead after the first frame. While the Marlins would fail to score again until the seventh inning stretch, allowing the Mets to tie it in the meantime, Ichiro Suzuki spanked a pinch-hit single to left through the hole at short, scoring J.T. Realmuto to break the tie. Miami wasn’t finished as Yelich sent another single to center scoring both Riddle and Suzuki to retake the lead for good. A.J. Ramos gave up a single to Jose Reyes, but retired the next three hitters for save number 13. Dan Straily got the no decision going 5 strong giving up 2 runs, one of them a dinger. It was back in the first to Curtis Granderson. Kyle Barraclough gave up a dinger of his own in the seventh to Mets catcher Travis d’Arnaud dooming Straily’s W. So it’s a nice start. With Jeff Locke coming up for Game 2, I had high hopes that he would finally get a win of his own, Volquez style. Yeah right. All it takes is one. In this case, one inning. Locke lasted through almost six and while he pitched great for the most part, it’s the first inning that would haunt him. He served up a 2-run homer to second basemen Asdrubal Cabrera and then a single to Jose Reyes, scoring Jay Bruce to make it 3-0. Locke recovered and locked it down, but the bullpen failed to keep the game close. The Mets added 3 more in the seventh as d’Arnaud scored on a force out and Curtis Granderson lifted another one into the bleachers, a two run shot to make it 6-0. While the rest of the gang was busy watching a legendary evening unfold at Ricardo Silva Stadium, I was busy taking one for the team Roger Dorn style. They tagged Junichi Tazawa for another pair in the eighth as Mets pinch-hitter Brandon Nimmo hit a 2-run single to center. Add in no run support with 7 hits sprinkled throughout the game and Locke falls to 0-4. Out of the four relievers sent in (McGowan, Nicolino, Tazawa, Worley) only Vance Worley left unscathed. Steven Matz pitched 7 fantastic innings in a game where the Marlins never truly mounted a serious threat, forcing them into 10 groundouts, including 2 double plays. The closest we got was in the third. J.T. Riddle opened the inning with a single, and with one out Dee Gordon smacked a base hit of his own. With Stanton up to bat, Matz fell behind 2-0 but in the end caused the big guy to hit into a double play, turning a potential burst of runs into a mere fizzle. An 8-0 shutout. While our hopes for a lovely sweep vanished into thin air, winning the series was still viable especially with José Ureña as the starter. Unfortunately, the first third of the game ultimately dooms the Marlins torpedoing any chances of that. This time, it’s New York scoring early and often with Mets duo Jay Bruce and T.J. Rivera helping to jump ahead 2-0. In the third, the New York duo struck again with hits into leftfield topped with a sac fly from Reyes to make it 5-0. Stanton got us on the board in the fourth with a one-run rocket. Later, Prado lined one to left in the sixth, scoring Giancarlo to make it 5-2. Then with Bour at the plate, Yelich scored on a wild pitch to make it 5-3 but that’s as good as it gets, we lost 6-3. At the bottom of the seventh Realmuto got things started, slapping the ball into left getting a base hit. The Marlins then hit a wall as Suzuki, Riddle and Ozuna were retired to end the inning. Similarly, Martin Prado began the final inning with a single. It happened again, our next 3 batters: Bour, Realmuto and Suzuki are put away ending the game. Doah! José Ureña’s streak goes bye-bye, falling to 6-3 after pitching 6 innings giving up 5 runs, 3 of them earned, on 6 hits. Now for the fun stuff. Personally, I had yet to vote in the All-Star Ballot and given our rather blah series defeat I decided to give the Marlins one last boost in my lofty quest of sending at least 5 of our fish to the summer classic. I present to you my vote for the 2017 All-Star Game! Keep in mind there is a bit of bias but a lot of it is looked at with an eye towards the stats. 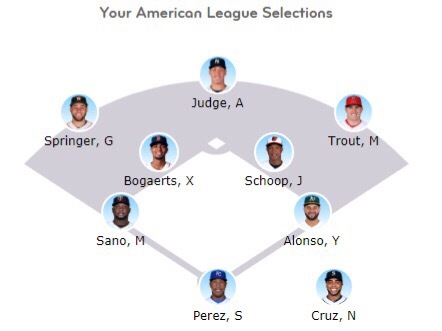 On the AL side, for example, I was torn between Jonathan Schoop and José Altuve. Sure Altuve’s average is .327 but Schoop had 4 more Homers (15) and 11 more RBIs (49) though Altuve has him beat, in spades, when it comes to steals. On the NL side I went Dee Gordon without hesitation despite a very deserving Daniel Murphy from the Washington Nationals, here I will admit its team bias. 336 AVG, 14 HRs and 55 RBIs what’s not to like? Over at the hot corner in the American league, I went for Miguel Sanó (.270/18 HR/53 RBIs) from the Minnesota Twins over Mike Moustakas (.272/20 HR/47 RBIs) out of Kansas City but just barely. Both guys put up good numbers and an argument can be made for either. I sort of went with the Twins out of some strange longing to see a Twins All-Star. I miss 2009 where Minnesota had some serious representation in Joe Nathan, Joe Mauer, and Justin Morneau. I have absolutely nothing against the handful of All-Stars that represented the team after ’09, I just liked this trio from back in the day. Over in the National League, Jake Lamb was an easy pick from the Diamondbacks (.286/18 HR/64 RBIs). When I was picking out my positions for both sides, I think I had the hardest time with the AL’s outfield corps. There are quite a few deserving players but my top 3 are a very interesting trio: namely Aaron Judge (This kid is freakishly good), Khris Davis, and George Springer. One honorable mention is Avisail Garcia from the Chicago Whitesox. The guy is sporting a .318 average with 51 RBIs and 11 Homers. As a disclaimer I accidentally went full knucklehead and selected the injured Mike Trout. Whoops. 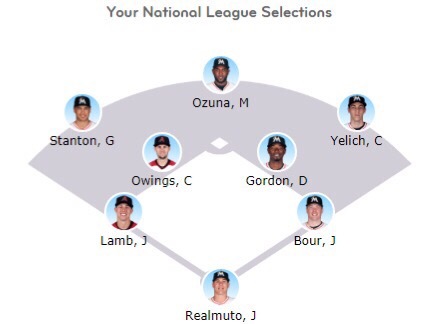 Lastly, for the National League I went all in giving our Tres Caballeros the stamp of approval, voting for none other than Marcell Ozuna, Giancarlo Stanton and Christian Yelich. The first two are our muscle while Yelich has some pop of his own. I also picked him not only because he is having a good season thus far, but man during the World Baseball Classic he was helping carry that U.S. squad. It isn’t part of the regular season but it counts for me! Those are my choices for this year’s All-Star Game and with luck several Marlins get in for the home crowd. Either way, it’s going to be a doozy. Until then, stay frosty!